Admit it: You’re gonna notice a title like that, yes? 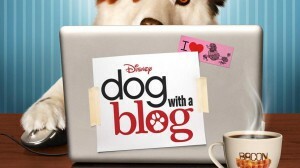 Dog with a Blog is a new mid-season replacement sitcom series picked up by the Disney Channel. Here’s part of the press release: “In the premiere episode, Bennett [the dad] adopts a shelter dog in the hopes that it will inspire Tyler and Avery [the siblings] to get along and bond over taking care of him. That happens – to some extent – when the kids discover that their seemingly ordinary dog can talk. From that moment on, Tyler and Avery agree on one thing: Stan’s ability to speak must be kept a secret from everyone, even their parents. As the kids learn to work together to keep Stan’s secret safe, they soon find that his canine point of view, whether in the home, in the yard or in the park, helps them navigate their new sibling situation and, ultimately, becomes the tie that binds the family.” The series comes to Disney Channel on Friday, October 12th. Starting on September 18th, regular posts from the talking and Internet-savvy dog himself will be available at SeeStanBlog.com.